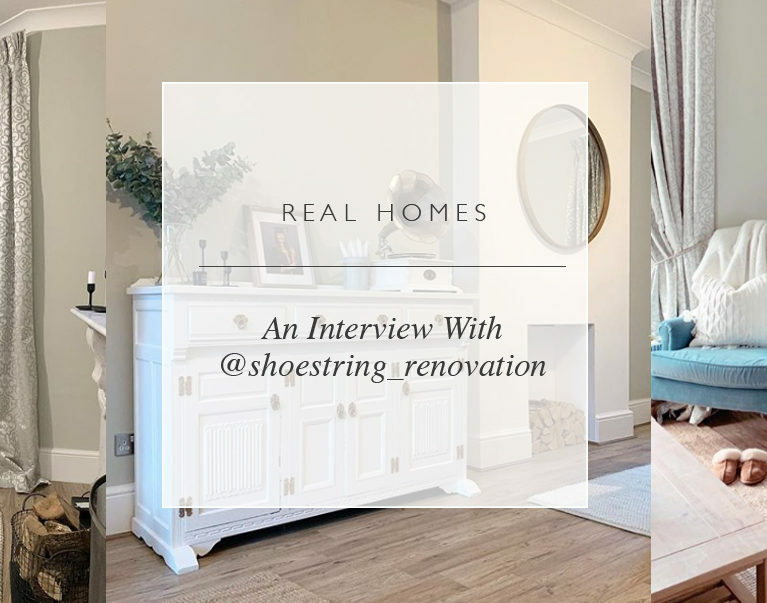 We’re pleased to introduce Instagram interior design star Jodie @shoestring_renovation, the next interiors influencer to take part in our Real Homes series. In 2017, Jodie and her partner Terry purchased their self-proclaimed ‘doer upper’, a three-bedroom Victorian property in south London. 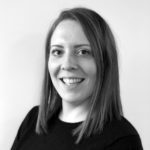 Over the last two years, she has posted about their renovation journey online, building up an impressive following of interior design fans. Elegant, personalised and oh-so lovingly put together, Jodie’s enviable home mixes the scale and ornamentation of Victorian design with the sleekness and light of contemporary interiors. I would say that I love to mix the old with the new. I’m pretty obsessed with Victorian style; the use of antique pine woods, vintage furniture, wooden panelling and velvet fabrics just excites me. However, I like this Victorian style to be refreshed with light and airy interiors, giving a good sense of space and adding a modern touch. Oh gosh, our whole home has been an entire design project, and a very slow one at that! When we bought this home, it needed a total renovation. There was not one room that didn’t need tearing apart. However, the first room that we managed to finish was the bathroom – through the powers of Facebook marketplace. If it wasn’t for our £75 freestanding cast iron bath, it would have potentially delayed our project for months, as we would have to save for the bath of our dreams. What was the most exciting or challenging part of renovating your home? There have been many exciting parts of our renovation. My favourite was when we decided to panel our master bedroom. Using Pinterest for inspiration, I came across some beautiful rooms that used panelling as a way to enhance the look. 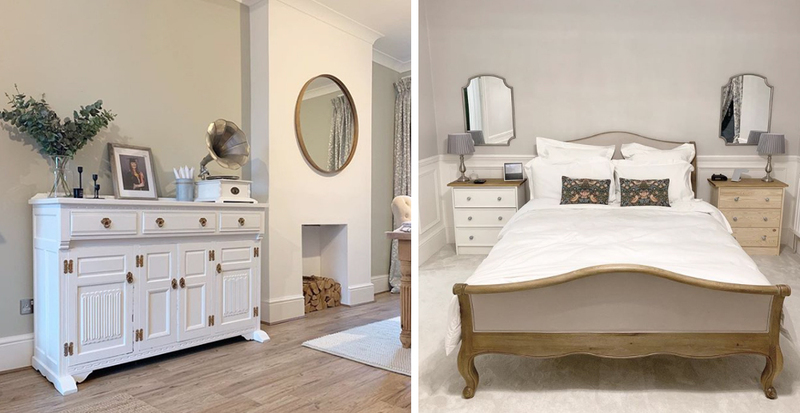 We ran with this and, with the mix of greys, whites, blues and natural pine wood, we have managed to create a space that is cosy and Victorian-esque but also stylish… and all this on a tiny budget! Pinterest and Instagram. I also love to snoop around old period buildings on Rightmove that are furnished… Is that weird? Yes, probably! Homesense. It’s pretty much the only shop that I buy my homeware goods from. The reason being is that I like to have furnishings and accessories that no one else has, or at least, that the many don’t have. You can find super quirky and interesting pieces in Homesense and I can never walk out of that shop without buying something, even if it is a dishcloth! We have three major projects coming up for us, which is likely to take over the next two years. These are the guest room, front drive and garden. The latter two will be the most costly. I’m hoping to start on the guest room pretty soon, as now that we have a kitchen, I can finally have friends over to stay. I like patterned designs when it comes to window dressings. I feel you can really make a statement with your choice of fabric, and a bold choice can exude elegance and style. As I love older interior designs, particularly the Arts and Crafts movement and the likes of William Morris, I tend to lean towards designs that incorporate different textures. I believe that these fabrics appear more expensive and add a ’boutique hotel’ vibe to your interior design. Oh gosh, £10,000. As much as I have just renovated our kitchen, it has been completely renovated on a budget. But if I had that amount of money, I definitely would have bought a beautiful Range cooker or perhaps an Aga. But then again, I would have to learn to cook on one of those first! 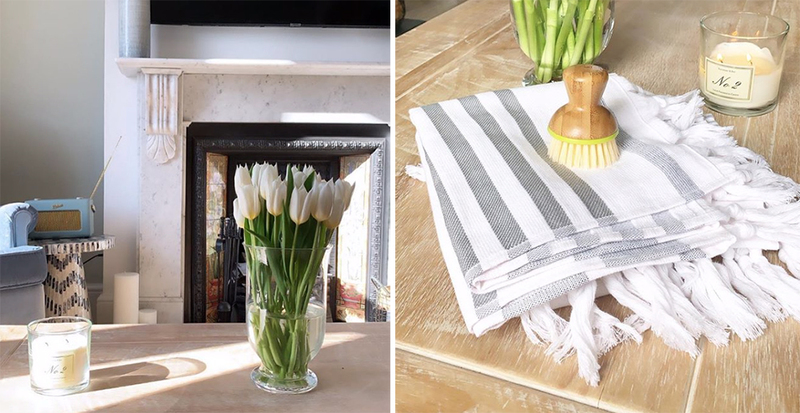 What are your top tips for someone planning a renovation? First, work out a budget. Set that as your minimum, not your maximum, and maybe times that by two… Ok, that’s a joke, I think… Problems will arise that are totally unforeseen and are usually expensive to fix. For example, our ‘fixer upper’ needed central heating, but we didn’t account for our house to have such low water pressure that it wasn’t capable of firing up a central heating system. This meant we had to spend a month digging up our front drive way to replace our water mains. A costly project, which we did ourselves, and which delayed the project massively. It has also resulted in us needed to replace our driveway! Next, stop feeling demoralised. I know this sounds mad, but it is easy to compare your renovation to others on social media and wonder why you don’t have enough money, time, equipment or contacts for your house to look as polished and perfected as theirs. So embrace eating your dinners on your wooden floors, and washing your clothes in the bath tub. This is all part of your renovation and you will see it through. Also, YouTube is the best place to learn new skills when you can’t afford to get the workmen in. And finally, don’t be afraid of making mistakes with paint. There have been two occasions where I have made massive ‘paint mistakes’ in the house, choosing dark colours that loved in other peoples homes but naturally weren’t my style. Paint is only paint, you can paint over it if you make a mistake. So don’t be afraid to experiment and learn to know what you love. A great big thank you to Jodie for welcoming us inside. 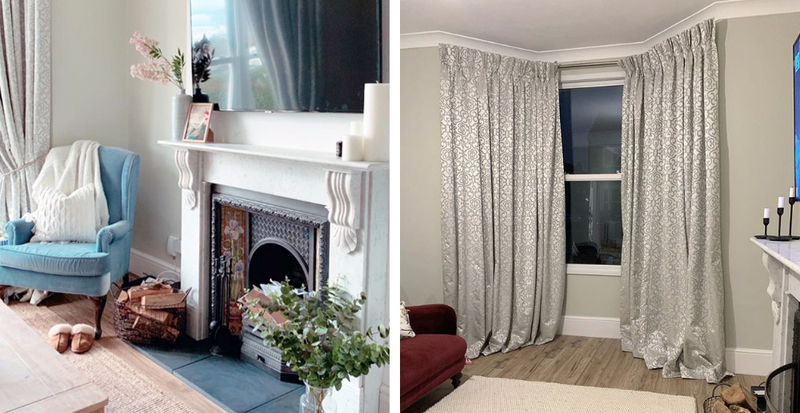 We are so pleased that we could provide our Bellucci Ivory Curtain for her beautiful living room, and we look forward to dressing more windows in future. Be sure to stop by Jodie’s Instagram account, @shoestring_renovation, and let her know we sent you over.